I think we should look with huge skepticism whenever a company, particularly a credit card company, encourages us to spend money. Even under the guise of "X% of the proceeds will go to fighting toenail fungus", I tend to think the overall goal is to part me from money I don't have and make me want things I don't need. But then American Express came out with this "Small Business Saturday" idea. You know, it's a great idea. If you haven't a clue what it's all about, and admittedly, I should have blogged about this a week ago, but I've been preoccupied with other blog posts, American Express came up with this idea to promote the small businesses that form the backbone of the local economy. It's not the Walmarts or the JC Penneys or the Jewel grocery stores that pump money back into the community. It's the yarn shop, the tea house, the bookstore with square footage equal to my house who keep their profits in the community. So, I decided that the few places I still needed to frequent would be as local as I could make them and would be on Saturday. One of the great things about living in the Chicagoland area is the wealth of small downtowns with a wide variety of offerings. 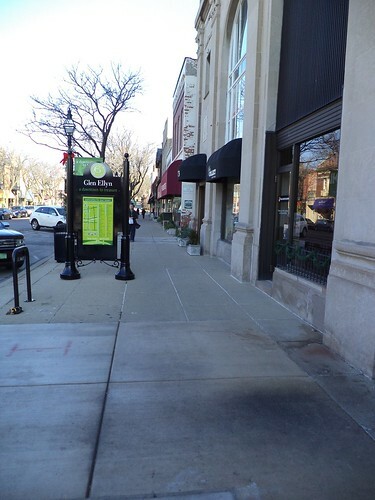 I went into downtown Glen Ellyn after getting my hair cut today. Antique stores, children's clothing and toys, stationary, framing, women's specialty clothing, bakery, shoe repair and my favorite bookstore on the planet, Just the Bookstore. I could be a bit biased since I used to work there but the personalized service you get from Jane, Sue, Linda, Jenny and Renee cannot be beat. It's time to replace the calendars in the house so they ordered 4 of the 5 I usually get. The other one they can't get so I'll have to order it on Cyber Monday. There was a book I'd read about which they just happened to get in the day I called about the calendars. "Oh Deb, we have this book that, when it was announced, we all said, 'That's a book for Deb'." Yeah, yes it is. I'd actually seen it but hadn't ordered it, yet. Buying locally makes me feel good. Could I get those books and the calendars for less somewhere else? Oh yeah, but when I walk in the store and they ask about my daughter, hand me something they think I might like, show off grandchildren photos and discuss where the kids are that our kids grew up with, it's family. I wound up having to go to Target because I couldn't find something that I wanted and the staff seemed more friendly than I remembered. It wasn't nearly as hectic as I expected today to be. Maybe that's why Target employees were happy. Small businesses are easily swallowed up by the Targets, the Walmarts, the Costcos. Every time you walk into one of those anywhere in the US, you know the shampoo will be over to the right, the printer paper will be off to the center and pet food tucked in the left corner. But you won't have someone asking how the girls are doing, I can guarantee that. So, I did my part today. I actually don't need a reason to shop locally and far prefer it, although, with some things, there are just limited options. If you're going to be a consumer, try to shop local. You win. Your shopkeeper wins. Your community wins. This is the point where I should plug the written word. Give a book. 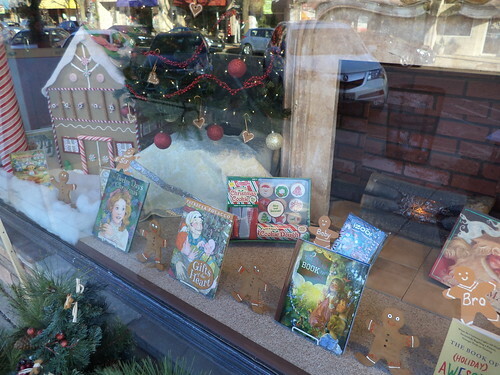 Go to your local bookstore and see what they have for Christmas. Give a classic. Give something new. If you're not going to crochet scarves for everyone on your list, give a book. In fact, if you email Just the Bookstore, they will ship anywhere in the US. I'm thinking I should go back and get that cookie making kit that's in the center of the display. I know a family who would love that. Love today's post. We need more people to hear this message and to shop local, small businesses!